Unless you’re a childcare worker, play is not something we get to do much as adults – the daily routine of work, parenthood or other commitments can prevent us from unleashing our inner child. So this month, we’ve dedicated this issue to play in all its forms! 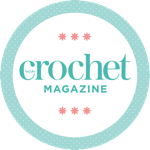 From fun and classic crocheted toys, to interesting experiments in stitch, colour and texture, the playful projects in this issue are just the thing to welcome in a new season and brighten our days. I had so much fun choosing the projects for this issue, and can’t resist beautiful handmade items for babies – like Sue Rawlinson’s gorgeous camera toys, Dawn Curran’s amazing romper with its kitten colourwork pocket, and Claire Montgomerie’s bonnet and bloomer set – all kindly modelled by her beautiful daughter! The shoot day was of course so much fun and I loved styling up all the gorgeous makes in our JJ Location house, which even had its own baby resident – young Atticus! For the more ‘grown-up’ grownups, we have some subtly playful garments, and Linda Skuja’s signature texture and eye for colour is given a fun slant with ’70s styling, while Cassie Ward’s loop stitch jacket gives us permission to play with stitch and fashion with its modern, cropped shape. So if you want some time to escape and experiment with stitch and colour, read on and enjoy this month’s makes!